This entry was posted in Education and tagged boomer, catalogue, storytelling, Travis Burchart. Bookmark the permalink. I love going to the library. 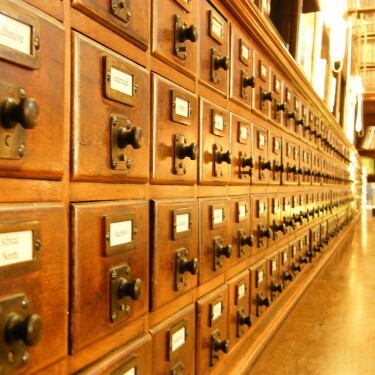 As I flipped through the card catalogue, like searching on the net, I was easily distracted by the titles of books typed on the 3 x 5 cards – literally walking with my fingers. This brought a smile to my lips and a bit of pain to my cuticles as I remembered those good old days of flipping through those card catalogs and then tracking down the books. I’m now on the Board of Directors for our local library district and see so many changes happening rapidly to our system with E-books, music downloads, and of course the internet. I like knowing I could still get by with the old way of doing things. There might be only a few of us who could still get by with the “old way of doing things.” It’s funny to think, but a short time ago, we depended upon the concept of “alphabetic order” to organize and narrow our encyclopedia/dictionary searches. Today, you Google exactly what you want, and the results are no long dependent upon the alphabet. Results are dependent upon algorithms, key words, AdWords, and search results (which can go on for hundreds of pages). Consequently, research is no longer at the mercy of A through Z. My “When I was your age …” running joke includes the following: When I was your age, cell phones consisted of finding a quarter for the pay phone or hoping the person you were dialing would be gracious enough to “accept” a collect call. Recently, we found one of the few telephone booths in the city, and my youngest child thought it was the neatest thing – that we could use money to “buy” a single phone call instead of just punching the numbers in our cell phones. Ah, the Dewy Decimal system at its best.